Before starting treatment with us he had undergone 2 months of physical therapy, and 2 months of chiropractic treatment. He had seen his family doctor who prescribed pain medication including narcotics for his pain. He had received 4 epidural shots into his spine to help relieve his pains and sciatica. Because all the conventional conservative treatments did not help him find any relief from his pain he eventually found himself in the office of a surgeon. The surgeon recommended surgery. Standard protocol for surgeons is if the patient is still suffering after having gone through conventional therapy the next step is surgery. After we performed the MRI and identified what was causing his pain and Sciatica we started his treatment to eliminate the causes of his Sciatica. When we started his treatment his pain was at a 7 in his back and leg. His ODI score on day one was at a 46. ODI is a score used by the medical community to identify how bad the pain is affecting your life. A score above 40 after conventional therapy is a candidate for surgery, and in his case the surgeon had recommended surgery. After 12 Functional Disc Rehydrating treatments his pain was down to a 2, and his ODI score was at a 24. He was responding well to therapy and we continued with his treatments. On his 24th treatment his pain was a 1 and his ODI was a 18. Our goal is to get the ODI score as close to zero as possible and eliminate the pain completely, the safe zone for the ODI is under 20. Under 20 the patient is able to perform all activities of daily living with little or no discomfort. He was responding well to our therapy and 8 more treatments were administered, and on his last visit, number 32, he was pain free. His pain was at a zero and his ODI was at a zero. Our treatment was able to eliminate the need for any more narcotics, shots or surgery. The patient was released from our care with simple instructions on how to maintain his pain free life. 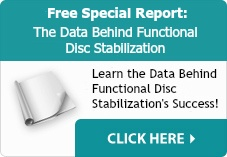 Our program is very successful with complicated back pain when others have failed because our treatment goes to the source of the problem and eliminates the cause: the disc. If you have pains that are not going away make an appointment now and eliminate your pain and avoid all the drugs and surgery!